Aldus Manutius (c.1450–1515) was the father of modern publishing. Born near Rome, he moved to Venice in the 1490s, where he formed the Aldine Press. The Aldine Press premiered an immensely popular new format well-designed editions of the secular classics Manutius called libelli portatiles, or portable little books because they easily fit in the hand of the reader, the first paperbacks. The many contributions to the art of printing made by Aldus Manutius include the first italic typeface, which he created with the type cutter Francesco Griffo. Italics were intended to mimic the humanist handwriting of the day. His work in developing the roman typeface devised for a 1496 book by the humanist scholar Pietro Bembo — the inspiration for the modern font Bembo, still treasured by book designers for its grace and readability. Although books were popular and in demand Manutius' finances were often unstable. He quarreled with his punchcutter, and he was forced to defend his work from both detractors and admirers. His attempts to secure his innovations against imitators are important moments in the history of copyright. 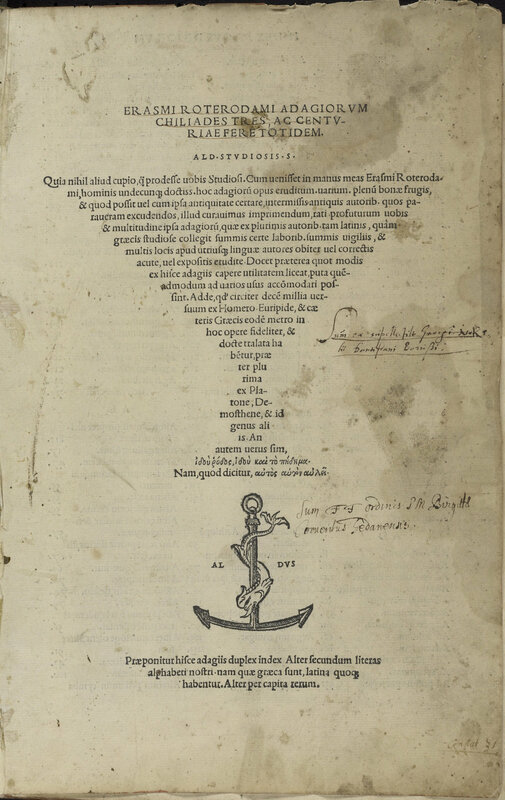 To that end, Aldus Manutius devised a trademark to identify his books in the marketplace. The trademark was based an ancient Roman coin given to him by Pietro Bembo. 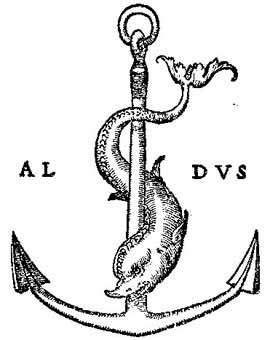 The symbol of the dolphin and anchor served as the model for this device. The inscription which reads ‘Make haste slowly’ was a favorite saying of Augustus and a slogan of Manutius'. A coin identical to this one was given to Aldus by Pietro Bembo and served as the model for the dolphin and anchor device. But although ‘Make haste slowly’ was a favourite saying of Augustus, there was no association in Antiquity between the image and the motto. Rather, this coin was struck in honour of Neptune – an attempt to appease the god following the eruption of Mount Vesuvius that destroyed Pompeii in 79 AD. Linda Secondari is an award winning Designer and Creative Director with more than 20 years of Design Strategy and Branding experience specializing in the publishing space. Linda is currently Creative Director for the Global Academic Business at Oxford University Press where she manages the Design Strategy Group, a team of 40 Designers and Art Directors split between OUP's Oxford, New York, Toronto, and Delhi offices. Linda and her award winning creative team are responsible for the Design development of over 3,000 print titles a year as well as many digital products. The team also engages with content areas at the Press in ideation and visioning exercises to facilitate collaborative engagement between key stakeholders in the development process for products.